Sweet picture! And how great to have something special to show how much a book meant to you from the beginning….and with your mother and siblings no less! You are so right. Words at the earliest age do inspire and shape these precious bright minds. Even when they don’t actually know the meaning of the words, the tonation, inflection, and pronunciation of the syllables serve great impact. The fascination with the reader to be able to move their mouths and eyes in rhythm and sync between the pages and the audience is captivating. I so remember these delightful settings with my parents and sibling. I am sure this is why my sibling and I were reading encyclopedias at the age of 3. We traveled the world through this media by spirit before we visited them in person. Thank you for recalling such glorious times. As with my parents, I hang onto every word of your writings. You put your reader where you are. I am truly not a reader of the ‘deep’ stuff. I do like a variety of books, though .. light, funny, some intrigue and some mystery. 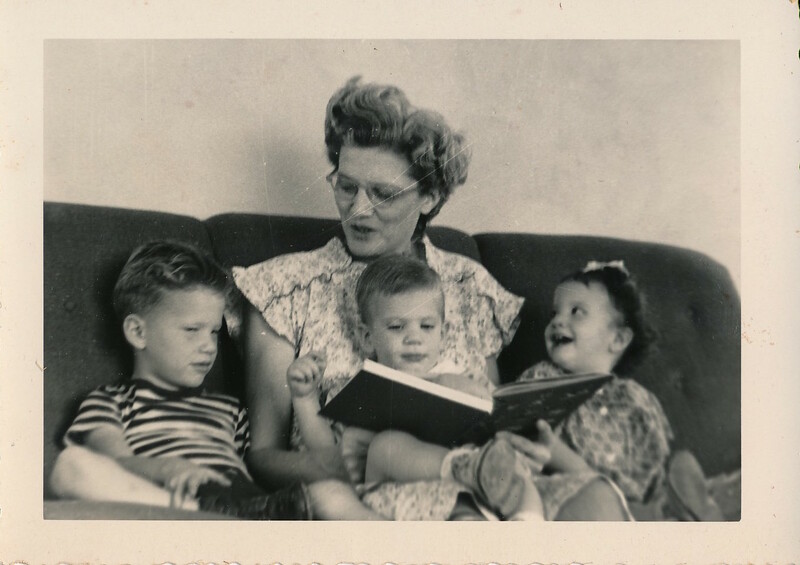 Some of my earliest memories are of reading, as well as being read to. I spent hours reading to my 2 sons, as well. But no matter the difference between what you and I might read or enjoy, I wish you success and continued good things in your writing career … and I am proud to say I know you! Your “athlete” brother in the picture also read to you and your twin on a regular basis. Reading to you most likely filled in the dreary winter days in Iowa or any other time I could not find an older friend to play baseball. I have a picture of me reading to you and David. Your expressions are about the same. You were a little older than in the picture you found. I do remember I did more than read to you. I taught you how to read! Naturally, I take great pride in your success in the world of publication, be they “how-tos” for quilters or your new foray into fiction. My pride in this is much like that of a former teacher whose student goes out into the world and does well on something with which you got them started.